Barb K’s famous recipe….these are wonderful! In a bowl, beat cream cheese with an electric mixer until fluffy. Add condensed milk, egg and vanilla and beat until creamy. Pour cream cheese mixture over bottom crust in pan. 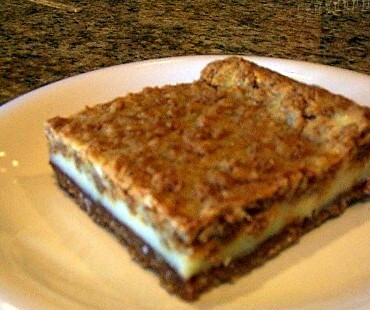 Top with remainder of graham cracker crumb mixture. Bake 25-30 minutes at 350° or until a toothpick inserted in the center comes out clean. Cool, cut and then chill until ready to serve – refrigerate leftovers.